The Rasta Hat, also known as the Rasta Cap, is a tall, round, usually a crocheted hat and brightly coloured. It is most useful as a way for Rastafarians (Rastas) and other dreadlock wearers to tuck their dreadlocks away, but may be worn for various other reasons by Rastas and non-Rastas. The Rasta Hat is worn mostly by men and is rather like an extra large tuque in construction. Most commonly crocheted, the hat can also be knit, woven, sewn, or constructed in a number of other ways. Rasta Hats range in size and shape, as well as uses. People with dreadlocks and non-dreaded people alike wear rastacaps for fashion, convenience, socio-political statement, and a number of other reasons. 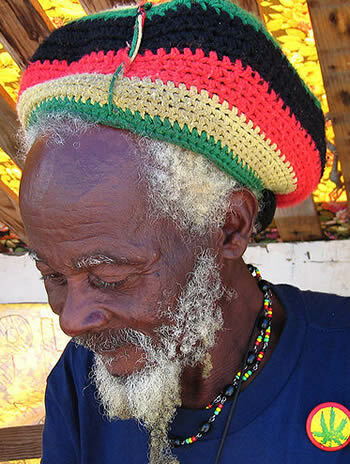 Some Rastas also wear rastacaps and other forms of headdress as a religious head covering.